Give round one of the cat fight to the Cougars. In the only regular season meeting of the Junior A Aurora Tigers and Cobourg Cougars, the Cougars came out on top in a 4 – 1 final Friday night at the Aurora Community Centre. Each the top team in their respective OJHL divisions, the offensive weapons of the Cougars got to work early in beating Aurora keeper Christian Filippetti just over a minute in, doubling their lead before the first break. Filippetti settled in in the second period, allowing just one of the nine shots he faced to get passed, though Aurora struggled to find the answer to Cobourg keeper Dershahn Stewart in maintaining a 3 – 0 score. Tyler Davis finally got Aurora on the board early in the third with his tenth of the year, though it was too little too late, as Cobourg added a late powerplay marker. Losing in regulation for just the sixth time this season, it was Davis who got the Tigers back on track the following night in a match with the Toronto Jr. Patriots, in on four of the six Aurora goals of a 6 – 4 victory. Up 2 – 0 early in the second period, Davis put home a rebound on a Joseph Mizzi shot, while his second came with the Tigers up 4 – 3 in the third period on a nice cross-ice feed from Mizzi. He wrapped up his first hat trick of the season just over three minutes later on a side-of-the-net powerplay goal. Mizzi wrapped up the week with a three-point effort of his own, extending his lead atop the league’s scoring race by two with 38 points on the season. Not lost in the win is the first appearance of the season for Cale McWilliams between the Aurora pipes, a veteran of a handful of games last season at just sixteen years old. He goes to a perfect 1 – 0 record in stopping 31 of 35 shots faced. The Tigers are bracing for a busy week ahead with three games in four nights on the schedule, paying a visit to the basement-dwelling Stouffville Spirit (3-14-0-1) on Thursday. Aurora has beaten up on the Spirit in their prior two meetings this season, winning 8 – 0 and 5 – 1 respectively. The Tigers then host the Spirit in the second half of a back-to-back on Friday at the Aurora Community Centre, with puck drop set for 7:30 p.m. They wrap up the weekend Sunday in Brantford to get their first look at the new 99ers, formerly the Milton Icehawks. 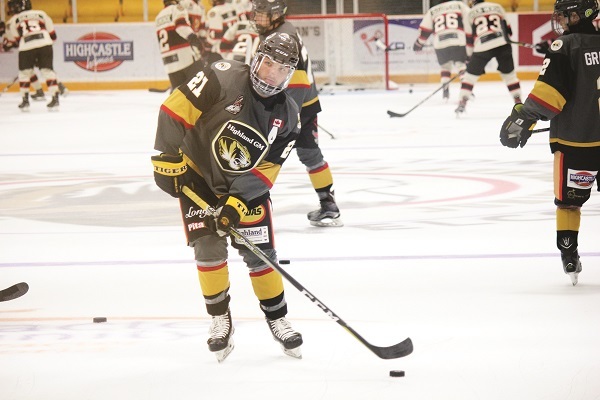 With wins in six of their last eight games, the Tigers continue to pace the PJHL’s North division by a healthy nine-point margin over the Markham Royals. They sit eight points back of the Oakville Blades for tops in the NorthWest conference.